The number of obese adults, along with related disease rates and health care costs, are on course to increase dramatically in every state in the country over the next 20 years, according to F as in Fat: How Obesity Threatens America's Future 2012, a report released by Trust for America's Health (TFAH) and the Robert Wood Johnson Foundation (RWJF). The report states the percentage of obese Connecticut residents could double by 2030, but even if it did, the state still would have one of the lowest obesity rates in the country. The report also shows that states could prevent obesity-related diseases and save on health costs with the average body mass index of residents was reduced by just 5 percent by 2030. For a 6-foot-tall person weighing 200 pounds, a 5 percent reduction in BMI would be the equivalent of losing about 10 pounds. Connecticut could save about $7.3 billion by 2030 if BMIs take a 5 percent dip. The number of people developing diseases such as hypertension and type 2 diabetes would also lessen if the state slimmed down a bit. Connecticut has long been one of the slimmer states in the nation. 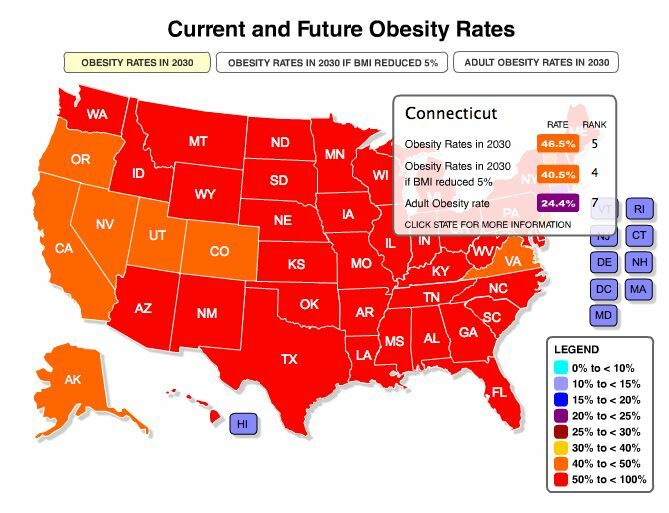 Statistics released earlier this summer by the Centers for Disease Control and Prevention and TFAH's Analysis of Obesity Rates by State showed that Connecticut has one of the lowest obesity rates in the country and has the seventh lowest rate in the country, tying with Nevada and New York. Even with an obesity rate of 46.5 percent, Connecticut would still be lean compared to many other states.